If there's an English expression saying the same thing, I'm not familiar with it. Literally translated this Dutch expression means 'Promise creates debt', so, in effect, it cautions us to live up to our promises. Which is exactly what I plan on doing, despite being a bit late. Early in January, I promised to try and do more tutorials. And to do a tutorial of one of the Giveaway-patterns. I knew I wouldn't have time for it that month, but by now, we're half-way through February. So, here it is. This is how you make your very own 'tiny shrug' pattern. 1. Start out with a pattern for a basic fitted t-shirt. This is Burdastyle's Lydia, but any other one will do as well (if it has bust darts, don't pay attention to them, this pattern doesn't reach down that low). 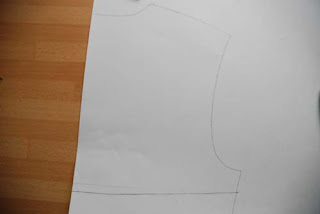 Because I'm using a Burdastyle pattern here, I explain the whole thing for a pattern which includes 1,5 cm seam allowance. Just skip all the parts about compensating for that if you use a pattern without seam allowance. 2. 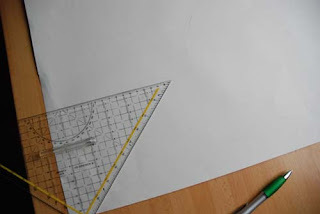 Trace the back body piece onto a sheet of paper. 3. Mark a point at the side seam 3 cm below the armhole (to compensate for the included seam allowance). 4. 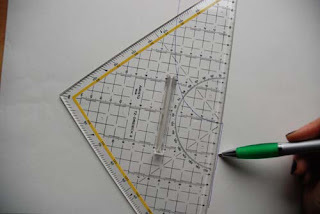 Draw a help line at a 90 degree angle from center back to the point you marked at the side. 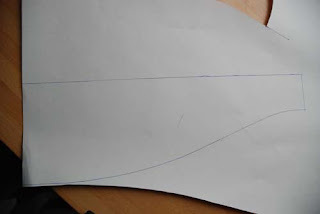 Then, go down 1 cm more at center back and create a gently curved bottom to your back piece. 5. Mark a line 3 cm below the shoulder line, to compensate for seam allowances. 6. 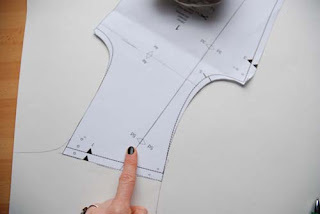 Trace the front pattern piece with its shoulder line along the line you just made. 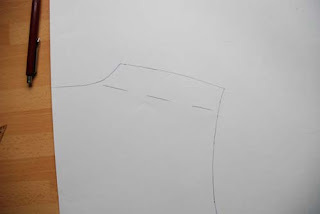 For you final pattern, make sure to mark where the shoulder seam would have been (this is the top of the shoulder, knowing where that is makes setting the sleeves easier). 7. Mark a point 3 cm below the armhole (seam allowence). 8. 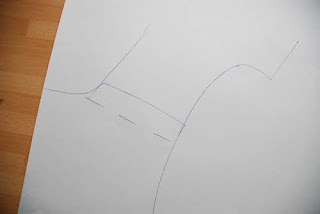 Draw a gentle curve from the neckline to the point you've just marked. Take care never to get closer than 3 cm to any of the original pattern's lines. 9. This is your finished body piece. 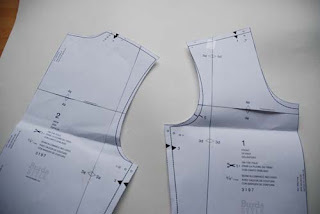 Now, mark the actual stitching lines along bottom and neckline and measure these. 11. At the paper's edge, this pattern piece is 15 cm wide, at the other end just 6 cm (this is including seam allowance, substract 1,5 cm for without). 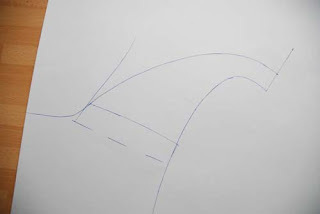 Draw a gentle curve from one end to the other, making sure to start and finish at a 90 degree angle. 12. 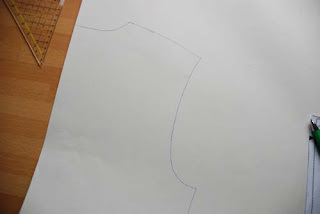 Fold the paper in half along the straight line of your new pattern piece, tack it in place and cut. 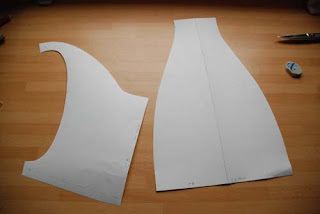 Now, you have these two pattern pieces. Both have a single straight line which is the center back and should be cut on the fold. 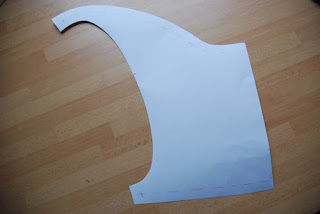 As mentioned above, cut the pieces you made on the fold and use the normal sleeve pattern piece, at any length you like. Set the sleeves into the body piece. Sew sleeve seam and (tiny) side seam. Sew short ends of the new pattern piece together. Fold it in half, right side out. Pin it to the rest of the shrug. The seam should be at the center back of the neck, the center back should be at the body piece's center back bottom. Stitch it in place stretching the new piece to fit as you go. Good luck, and if you make the tiny shrug, I'd love to see the result! Thank you SO much! I've been looking at my patterns, and looking at shrugs, but I hadn't quite figured out how to make it work yet. Can you supply a picture of the finished shrug or a link to a picture if you posted it on your blog earlier? Somehow, I can't get my mind around how those pieces will work. Thank you. I'll have to try this out sometime! Thankyou for taking the time to do a tutorial. Your Dutch expression is short and sweet and I can think of no equivalent in the English repertoire! I just now realized that this post is about how to draft the shrug pattern. Thanks for posting this! Yippie, you chose the pattern I wanted! After my week skiing (next week), I must make one... thank you! It's so interesting to read dutch, the sentece above is really easy to understand for a swede who speaks english, belofte must be the same word as löfte in swedish (=promise) and schuld the same as skuld (=guilt or debt). Maakt would be makes or creates, obviously (that one is totally different in swedish though). Btw, it was great fun to go to Holland with my arcitecture class during my exchange year in Manchester, I could read the dutch menus (most of it anyway), you should have seen their faces ;-). Anyway, you are now released from your promise, no more debt!